The uAlpine's Multi-action Tru-air purification process, featuring the Ioncluster Technology, purifies your surroundings and provides clean, fresh air for easier breathing to enhance your family's respiratory well-being. Imagine a home with clean, purified air - where you can watch your children play happily at ease; where your elderly parents can breathe deeper and more easily; and where you and your spouse can sleep soundly, knowing that the uAlpine is protecting you and your family from the invisible pollutants in the air. 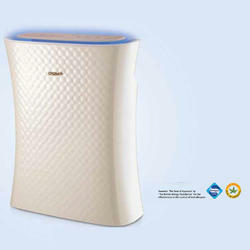 uAlpine The air purifier for better respiratory well-being Clean & purified air Imagine a home with clean, purified air - where you can watch your children play happily at ease; where your elderly parents can breathe deeper and more easily; and where you and your spouse can sleep soundly, knowing that the uAlpine is protecting you and your family from the invisible pollutants in the air.These invisible pollutants accumulate in our living space, weakening our immune systems, and are often the main cause of allergies and respiratory ailments. 360° Surround air flow - The uAlpine with its 360° surround air flow design ensures purification reaches its full potential by effectively circulating clean, purified air evenly in the room. Air quality sensor lights - Equipped with a smart air quality sensor, the uAlpine automatically monitors the air quality of the room when in 'Auto' mode and provides a quick indication through the display of different colored lights. It will then adjust the rate of purification accordingly with the different fan speed selections (Lo, Mid, Hi) to ensure effective purification. Filter life indicator - Keeping the air indoors clean is a continuous effort. The uAlpine's filter life indicator will light up to indicate a replacement of the True HEPA filter and/or 2-in-1 Formaldehyde & granular activated carbon filter is necessary so that the purification efficiency of the uAlpine is never compromised. Timer function - For busy households who do not wish to have the uAlpine switched on the whole day, nor have the time to monitor the duration of its use, the uAlpine comes with a timer function set at intervals of one, two, four and eight hours for your convenience, as well as better energy efficiency and savings. Particulate matter, or PM 2.5, refers to tiny particles in the air such as dust, soot, smoke and liquid droplets that are 2.5 microns or less in size (one micron is a thousand times smaller than a millimetre). These fine particles are believed to pose the greatest health risk as they can lodge themselves deep inside the lungs and may cause nose, throat and lung irritation. The uAlpine air purifier removes 99% of PM 2.5^ with its True HEPA filter, which filters particles as small as 0.3 microns in size. The 2-in-1 Formaldehyde granular activated carbon filter also helps to eradicate smoke particles that cause the burnt smell often found in polluted air.